During the renaissance interior designers had to find ways to make spaces brighter and more compelling without the use of electric light. One of their favourite ways to do this was by creating large windows and employing mirrors generously throughout the house to reflect light that came in through those windows. Today, with the cost of energy so high and future supplies uncertain saving energy is at the forefront of everyone’s thinking. As such designers and homeowners are once again looking for ways to make their space brighter and livelier that don’t involve using electricity. And just like their forebears they’ve turned to the mirror. Many homes are not designed to make maximum use of natural light. As such it’s up to those who inhabit the house to try and turn gloomy, underlit spaces into bright, cheerful rooms everyone can enjoy. 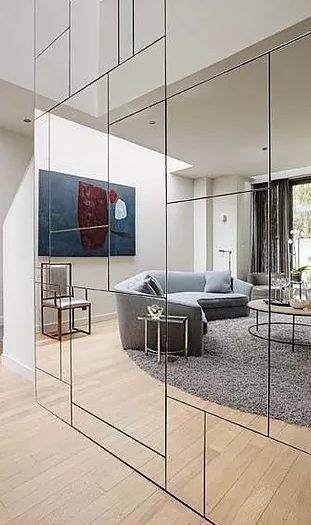 One of the easiest and most compelling ways to do so is to installmirror walls at strategic points throughout the house.Before you go ahead and just slap up a few ceiling to floor mirrors however there are a few things you’ll want to keep in mind. Size - When it comes to maximizing the reflective quality of mirrored walls the larger the mirrored surface the better. Not only will your previously moribund room be brought into the light but it will seem larger and airier than it ever has before. Placement - The placement of mirror walls in homes need to be carefully considered. You don’t want mirrors to shine bright reflected sunlight directly in people’s faces as they’re trying to watch TV nor do you want to locate a mirrored wall in such a way that it presents a clear view into the bathroom. Instead locate them in ways that will indirectly reflect the natural or artificial light and don’t overdo their use. Style - For many homeowners simple, large, frameless mirrors may be exactly what the style doctor ordered. For others however, a more lavish style of mirroring may be called for. Perhaps you’ll want a wall composed of multiple small mirrors (either framed or unframed) that dovetails with the busier design of the overall space. Perhaps you’ll want those mirrored sections to have bevelled edges or the surface itself to be rippled out of concern for both style and safety. Who is in the house - While mirrored walls produce compelling effects that are endlessly fascinating and open up a slew of related design possibilities regarding the creation of focal points and counterpoints they are nonetheless large slabs of glass. If you have young children you should be careful where you install mirrored panels as kids aren’t always thoughtful when it comes to where they’re going. Installing mirror walls in homes is a great way to bring light into otherwise dark and dull spaces, especially during the long winter months. Talk with our managers about the possibilities of mirror walls for your home.